I picked up some foam rubber placemats in the dollar bins at Target a while back. They were too groovy to pass up! I just loved the 1970’sish graphic print. And although I think they would look fabulous on somebody’s poolside spread, they would look odd on my old fashioned wooden dining table. Plus, lets be honest, I don’t really use placemats very often. Most of my meals at home are consumed sitting on the sofa, on the floor, or standing over the kitchen sink. So yeah. These sat in drawer for a quite a while…. So I turned them into bulletin boards. If you didn’t know, I like bulletin boards. A lot. 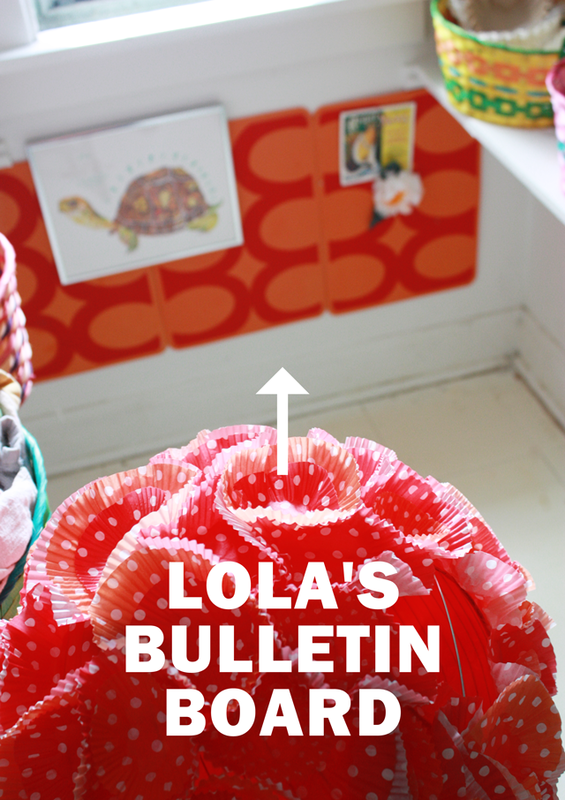 I keep bulletin boards all over the house, including above Lola’s eating area. This may sound weird to you but I think it’s a nice place to post pictures of her kitty friends and cousins. I strongly believe in ART FOR ALL. This includes cats! You could use thumb tacks, but I like pearl-head dress pins. 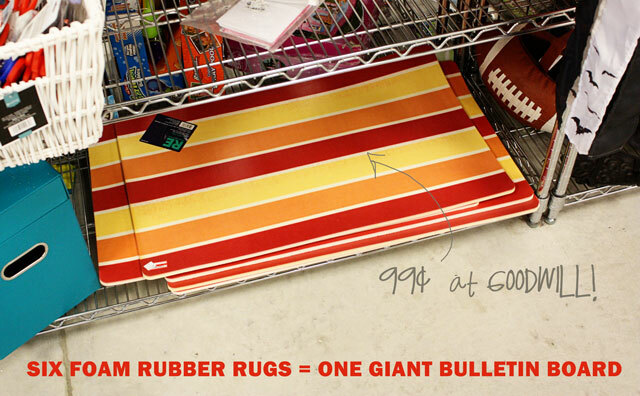 They are cheaper, spiffier, and stronger than regular tacks. But don’t mind me. That’s just my opinion. Yeah. It could be worse. 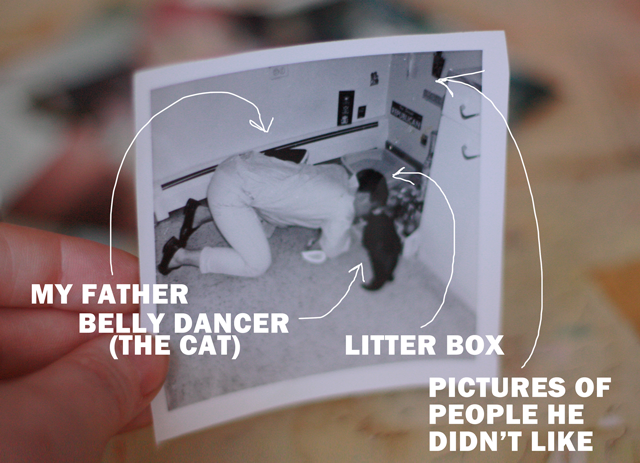 My dad kept a “litter box gallery” for as long as I can remember. He used it to post pictures of his least favorite people, news articles of interest, and cat themed comic strips. This meant Belly Dancer spent most of the 70’s staring at his ex-wife and transcripts of the Nixon tapes. Yes, she was a very informed cat. « You will never look at scissors the same way. I swear that we were separated at birth and by a few years…I actually paved the way for you in the US. We had a black cat named Bob. Bob used to love to watch golf on TV. One Christmas I bought Bob a golf magazine and after we used the magazine as a sword for a few months, I hung up pictures of golfers by his litter box. PLUS we got our cat Moosh on May 5th which means Lola and Moosh are practically related as well….. I don’t have a bulletin board for my boys, but it’s a good idea. However, Pedro, at least, is very educated. He not only spent his first day with me inside my HTML text book, but has since spent alot of time on physics and math textbooks. Fuzzles appears to be a computer geek as he is always putting appointments in my computer calendar, updating my status on Facebook, and once restarted my computer in safe mode! He doesn’t read much though. I am still laughing over Belly Dancer and the Nixon transcripts!! Not to mention the ex-wife thing! Now I know where you get your sense of humor. A fabulous one at that! My favorite color is also leopard!!! A bit harder to pull off in most situations when your 62. Do I care? Hell no! Your dad sounds like a hilarious guy. Great idea, I love that you are carrying on this important tradition! Just regular house nails. If you worry they will tear through the rubber mat, find a decorate button and nail through the button whole before inserting it in the place mat. 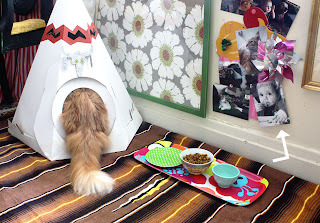 i’m so doing this for my stella. great idea! however, i am concerned for the safety of lola. i heard awhile back that one of the biggest dangers to house cats is sewing needles/pins. that cats will ingest them and they can puncture their organs and can result in… bad things. this could possibly be an old wives tale, but since then i have been religious about putting away my needles and not keeping a pincushion out in the open. maybe there is another option to securing lola’s treasures that won’t be dangerous? like i said, maybe it’s not true… but i’m a worrywart! such a great idea! i definitely want to create a board for my stella. however, i am concerned for the safety of lola. i heard awhile back that one of the greatest dangers to house cats is sewing needles and pins. that cats can ingest them, their organs get punctured and bad things can happen. it might be an old wives tale, but since then i have been religious about putting away my needles and pincushions. like i said, maybe it’s not a biggie, but i’m a worrywart. and i would hate for anything to happen to your beloved!